The late Thomas B. Fitzpatrick (19/12/1919 - 16/08/2003) a world renowned Dermatologist was the founding Author of Fitzpatrick’s Colour Atlas and Synopsis of Clinical Dermatology, he is credited with many significant achievements in the advancement of the field of Dermatology; the melanosome and tyrosinase, the epidermal melanin unit, skin phototypes, melanoma, PUVA photochemotherapy, sun protection factors, vitiligo, and many others. Outside of the medical fraternity Dr. Fitzpatrick is probably best known for his Fitzpatrick Skin Type Classification Scale which provides an objective assessment of the human skin; its colour (melanin) saturation, genetic predisposition, and skin reactions to ultraviolet light. Your clients Fitzpatrick Skin Type provides an indication of their possible reaction to sun exposure, predisposition towards skin cancers and it also provides an indication of the extent that their natural skin colour may influence the final colour of your cosmetic tattooing. You can determine your Fitzpatrick Skin Type and Phototype by completing the questionnaire below, some simple calculations are required to interpret the result and provide your Fitzpatrick skin type, the interactive form below does the calculations automatically and also provides some comments that will assist you to interpret the questionnaire results that are specific to cosmetic tattooing, you are also able to print your result if you wish to do so. What is the colour of your skin? NB. If you wish to print the table with the phototype colour swatch you need to adjust the page settings in your browser to print including background colours and images. 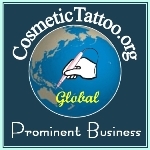 It is not uncommon for pigment manufacturers and cosmetic tattoo trainers to quote Fitzpatrick skin types within product literature and training programs but it is important to be aware of the limitations of Fitzpatrick skin types (in terms of its influence on the final healed colour results after cosmetic tattooing) because sometimes there is an overemphasis placed upon the Fitzpatrick Skin Type value in assisting with pigment colour selection, our Pigment Colour Selection Interactive provides the best guide for pigment selection. An objective assessment of melanin saturation (how much melanin is in the skin, higher levels of melanin will have a more profound effect on the final healed colour of a tattoo). An indication of which skin types are more likely to have a predisposition towards hyperreactive melanocytes (particularly Types IV - VI) which might result in hyper-pigmentary complications post tattooing. I stress again that it is important to keep in mind that a Fitzpatrick skin type is a guide towards melanin saturation it is not actually an assessment of skin hue, as mentioned previously melanin can add yellow, reddish, brown, black, and even blue or grey hues to the skin and sometimes brown hues may even have a blue-greenish tinge. For this reason part of your assessment of the clients skin colour should also include establishing what the dominant hue is because it will assist you in achieving more predictable outcomes. If you are having difficulty deciding what the dominant skin hue is for your client then a comparison to white (e.g. a sheet of white paper) or a comparison to the primary and secondary colours can sometimes help you decide which colour is most dominant in their skin.